The regional government of Valencia has joined a growing list of Spanish cities and regions that are taking steps to curb the rise of holiday rentals. 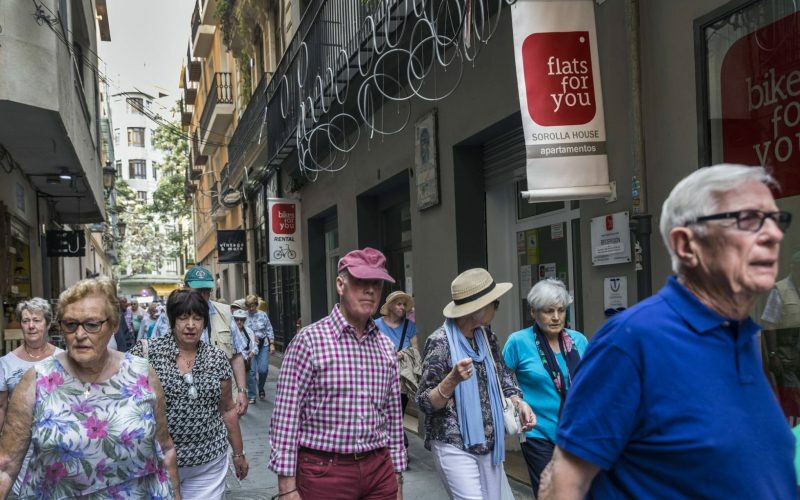 The battle is being fought in many of Spain’s most popular tourist destinations, where local residents complain that they are being priced out of their neighborhoods and subjected to constant noise and disturbances by holidaymakers. The most recent example is the city of Palma, on the Balearic island of Mallorca, which has banned tourist apartments altogether. On Tuesday, the regional parliament of Valencia agreed on amendments to a new Tourism Law that will be voted in before the summer. This new legislation will give local authorities wide latitude to regulate holiday rentals according to their own needs. In the city of Valencia, most new apartments destined for tourist use will be limited to ground-floor and first-floor units. Buildings that are used entirely for holiday rentals will require a hotel-like license, and new ones may not open in Ciutat Vella, the historical part of town. “With this new legislation, municipalities are going to take back control of what properties may be used for, and in Valencia we are going to raise a big entrance barrier to ensure the trend does not grow in future,” said Sandra Gómez, the deputy mayor of Valencia. In Barcelona, where the effects of holiday rentals are felt most keenly due to the large amount of online listings, authorities have already shut down around 1,000 apartments across the city and fined the websites Airbnb and Homeaway €600,000. The regional government of Catalonia has collected €4 million in fines since 2012. In the Madrid region, apartment owners may collectively decide through their community meetings to ban holiday rentals in their building. And city officials want to make owners of these tourist apartments obtain a special license if the property is going to be rented out for more than 90 days a year. In Andalusia, a 2016 law compels owners to register their properties on a holiday rental database. And other regional governments, including those of the Basque Country and Canary Islands, have begun drafting legislation to address this growing activity. According to the new legislation making its way through the Valencia parliament, owners will have to obtain a municipal report from local authorities authorizing their apartment’s use for tourism purposes. After that, they will need to add the property to a regional register. This will provide the property with a unique number that must be included in the online listing. If home-sharing websites refuse to list this number, they will face hefty penalties. The Valencia Tourism Agency has already fined Airbnb, Homeaway and Rentalia €30,000, and the new law raises sanctions for repeat offenders to as much as €600,000. “In order to bring some order into the tourism sector, we need consensus and alliances, but we also need to end the feeling of impunity. The fines we were imposing were not deterring the large online rental companies,” said Francesc Colomer, the head of the Valencia Tourism Agency and former mayor of the popular resort town of Benicàssim. Valencia has around 5,500 holiday apartments offering accommodation for around 20,000 tourists, compared to 16,200 hotel beds, according to the hospitality industry association Hosbec. But Deputy Mayor Gómez said that the situation is not yet a cause for concern, save for a few specific neighborhoods.